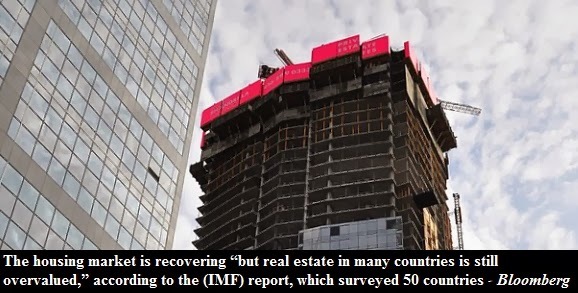 Global real estate prices hit the highest level since the end of 2008 according to the IMF. Yet, in many countries housing was still overvalued. Specifically, IMF singled out Canada where home prices were 85% above the long term average when compared to rents. According to the IMF this sort of overvaluation leaves room for corrections down the road. IMF was not the first to call Canada's housing market overvalued. Earlier this year the OECD and British financial magazine The Economist labeled Canadian real estate markets as frothy according to the above metric. Real estate prices are local but often times trends are worldwide. The below chart shows just that. The Canadian real estate market was not the only one shooting for the stars. In my post Ultimate Guide to the Housing Bubbles around the World I profiled over a dozen housing markets around the world and came to the conclusion that the recent housing bull market was a global phenomenon. While property prices have declined in some countries (US, Ireland, Spain and the Netherlands), prices continued to rise in Sweden, Norway, France and Canada. I think once those housing bubbles deflate, the global property index will decline further. Additionally, I think that the remaining property bubbles around the world will blow up pretty much at the same time. The global economy is currently a prisoner of low interest rates and ongoing quantitative easing. As David Stockman puts it, "Central banks all over the world have been massively expanding their balance sheets, and as a result of that there are bubbles in everything in the world, asset values are exaggerated everywhere." Rapid credit growth and low interest rates tend to inflate asset bubbles. For example, back in 1999 IMF warned Irish government of the dangers of sharply falling interest rates associated with joining the euro area. Specifically, IMF warned of the risk of an asset price bubble and the potential vulnerability of the banking sector. Unfortunately Irish government ignored the warning and, just like IMF predicted, the housing market in Ireland overheated and crashed. Banks suffered enormous loses that led to the bailout by the European Union. Similarly today there are many warnings of potential troubles brewing down the road. Unfortunally governments around the world keep with the status quo. When will the Canadian housing bubble pop? I don't know. I wouldn't be surprised if real estate prices go up another 30% for the next few years. For as long as global central banks are pumping money into the system who knows how long this game of musical chairs will last. I do think that most of the current worldwide asset bubbles will enter bear market right about the same time. But for the time being, the music plays on. Just listen to this. Julie Dickson, head of the Office of the Superintendent of Financial Institutions (OSFI), recently said that real estate construction in Canada had outpaced household formation for the past decade and a half. Hm, I suppose that's no good. Additionally, she said that residential investment was also at a two decade high. Ha, what could possibly go wrong? Damn, what was Poloz thinking last week when he declared that there is no housing bubble in Canada. Now, according to Julie's logic, Canadian banks will go on a lending spree. Hm, a good time to buy? "Over the long run, the need for extensive government backed mortgage insurance should be re-examined. The current system has its advantages, including as a macro-prudential tool. However, it exposes the fiscal budget to financial system risks and might distort the allocation of resources in favor of mortgages and away from more productive uses of capital. Against this background, the government’s recent initiatives to impose limits on government-backed mortgage insurance have been appropriate. Looking ahead, further measures should be considered to encourage appropriate risk retention by the private sector and increase the market share of private mortgage insurers. Importantly, any structural change should be made gradually over time to avoid any unintended consequence on financial stability."